An infection with the dangerous GandCrab 5.0.9 ransomware virus leads to serious security issues. With our removal guide, victims can try to secure their computers and restore encrypted files. In case that your Mac has been affected by GandCrab 5.0.9 or you suspect that other threats are running on it you can follow detailed instructions on how to detect and remove Mac viruses so you can keep the device clean and secure. GandCrab 5.0.9 crypto virus is the latest iteration of GandCrab ransomware family. This version of the devastating data locker ransomware has been recently released in attack campaigns against computer users worldwide. Threat actors could be utilizing widely used tactics of distribution to infect computer systems. Previous versions of the GandCrab ransomware family were found to make abuse systems by leveraging the CVE-2018-8120 vulnerability. This is a critical issue found in both desktop and server versions of the Windows operating system allowing hackers to run arbitrary code (the virus code) in kernel mode. The consequences of this is that the installed code will have complete access to the compromised system. Other methods used by the malicious actors behind GandCrab 5.0.9 include the coordination of SPAM email messages — they are used to spread the threat by sending out messages that pose as legitimate notifications sent by popular Internet portals or services that the targets may use. The virus files can be either directly attached or linked in the body. They can also be uploaded to fake download sites which are designed to appear like any of the popular Internet portals or vendor download sites. The malicious actors may use similar sounding domain names, certificates and hijacked design and contents to coerce the victims into thinking that they are accessing the legitimate address. Another way that the threat may spread is through infected payloads — the use of various files that are infected with virus code. A popular example is the malicious document which can take any form: presentations, rich text files, spreadsheets and databases. Once they are opened by the victims a notification message will pop-up asking the target users to enable the built-in scripts. If this is done the virus infection will follow. The other popular technique is the inclusion of the code in application installers. They are malicious copies of legitimate setup files of popular end-user programs that have been modified with the GandCrab 5.0.9 ransomware code. In certain cases the criminals may also be distributed via malicious browser plugins — additions to the most popular web browsers that are advertised as useful. The plugins are uploaded to the official repositories and often make use of fake or hijacked user reviews and developer credentials. Once they are installed by the users they will execute their built-in instructions that in many cases leads to the GandCrab 5.0.9 ransomware virus infection in the end. Another version of GandCrab ransomware virus has been spotted in the wild. Reports of security researchers indicate that GandCrab v5.0.9 is out. Even though it seems to be just a test version, it is still likely to infect users worldwide. And what we could expect from the creators of this notorious threat is the release of yet another improved version soon. Like all of the previous iterations (GandCrab v2, GandCrab v3, GandCrab v4, GandCrab v4.1, GandCrab v5, GandCrab 5.0.1, GandCrab 5.0.2, and GandCrab 5.0.3, GandCrab 5.0.4 and GandCrab 5.0.5) GandCrab 5.0.9 is designed to encrypt important files stored on the hosts it infects. An infection with this threat begins with the execution of its payload on the system. When first started on a target host, the payload of GandCrab 5.0.9 ransomware triggers a sequence of malicious activities. These activities aim to plague the settings of target system components. This in turn enables the threat to reach the main infection process – data encryption. According to the available reports, it will begin the infection only if it succeeds to mute or evade running security applications as they can block the correct execution of all malicious files. For this purpose the code of the ransomware is designed to obtain the list of all currently running apps and searches for signatures of anti-virus engines, debug environments and virtual machine hosts among them. Whenever it finds one of the mentioned the ransomware shuts all active associated processes or sometimes even deletes them from the machine. 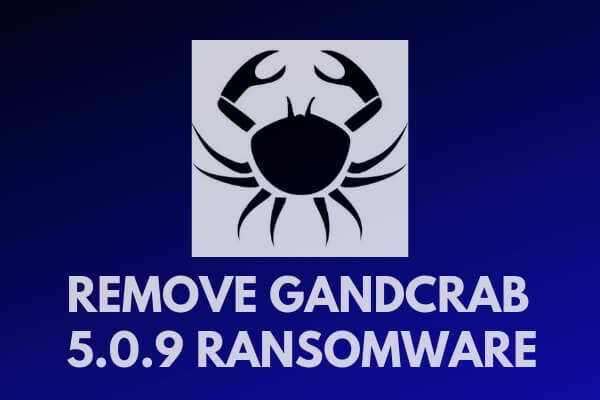 Next, GandCrab 5.0.9 ransomware virus could attempt to connect its command and control server in order to download additional malicious data needed for the completion of attack phases. It is also possible that its code could be configured to create malicious files directly on the system. Soon after the ransomware activates its additional malicious files it becomes able to corrupt specific system components that for example will enable its automatic execution on each system start. For the purpose GandCrab 5.0.9 ransomware virus needs to access the Registry Editor and add its associated values under some important registry keys. The ransomware usually plagues the Run and RunOnce sub-keys as they manage the automatic load of all essential system files and processes that need to be executed on each system start. Once the ransomware is ready with all system modifications it could continue with the data encryption phase. In order to complete it, the ransomware uses a built-in module that contains a sophisticated encryption algorithm which is likely to be the same as in previous versions – Salsa20. After this algorithm rewrites parts of the original code of target files these files become inaccessible. Unfortunately, to make victims more prone to pay the ransom, ransomware authors configure their malicious code to scan the system for all commonly used types of files as they are likely to store valuable information. So in case that you are a victim of this new GandCrab version 5.0.9, you may have all your documents, images, videos, projects, archives, and other valuable files locked. Corrupted files could be recognized by the distinctive extension appended to their names. As reported by security experts, it contains six random letters which are uniquely generated for each victim. Following encryption GandCrab 5.0.9 replaces current desktop wallpaper and displays a ransom message to extort a ransom payment for data restorations. However, since this is considered to be a test version, it is highly possible that the decryptor possessed by hacker may be inefficient. So be advised to avoid following their instructions as this step could lead to further loses and security problems. Please note that paying the requested ransom fee to cyber criminals does not really solve your problem with GandCrab 5.0.5 crypto virus. In fact, you only encourage hackers to continue spreading ransomware of this kind. Instead, you must remove the threat immediately, and only then look for optional ways to recover your data. WARNING! Manual removal of GandCrab 5.0.9 ransomware virus requires being familiar with system files and registries. Removing important data accidentally can lead to permanent system damage. If you don’t feel comfortable with manual instructions, download a powerful anti-malware tool that will scan your system for malware and clean it safely for you. WARNING! All files and objects associated with GandCrab 5.0.9 ransomware virus should be removed from the infected PC before any data recovery attempts. Otherwise the virus may encrypt restored files. Furthermore, a backup of all encrypted files stored on external media is highly recommendable.